Syracuse University’s Lutheran Campus Ministry (LCM) will kick off its 100th anniversary season on Sunday, Jan. 27, with a benefit concert organ recital by Syracuse University Organist Kola Owolabi. The concert, part of LCM’s annual Music Festival and Silent Auction, will begin at 4 p.m. at Good Shepherd Lutheran Church, 7248 Highbridge Road in Fayetteville. The suggested donation for the concert and reception is $15 for the general public, $10 for seniors and $5 for students. Admission is $5 for those wishing to attend the reception and basket auction only. Tickets can be reserved by calling Good Shepherd Lutheran Church at 637-9290 or emailing Lutheran@syr.edu. The program will feature music of two 17th- and 18th-century German composers who made prolific contributions to Lutheran church music, Johann Sebastian Bach and Georg Böhm, as well as an original composition by Owolabi. These works will be paired with 20th century Czech composer Petr Eben’s “Four Biblical Dances” (1990-91), which vividly portray four scenes from the Bible that incorporate dancing: The Dance of David before the Ark of the Covenant, The Dance of the Shulamite (Song of Solomon), The Dance of Jeptha’s Daughter and the Wedding in Cana. Shaped by Roman Catholic mysticism, Eben’s music provides an interesting complement to the works of Bach and Böhm, which infuse the chorale melodies central to Lutheran worship with the high art of baroque chamber music. The silent auction will feature baskets donated by members of local congregations and businesses, and include creative items for animal lovers, cookie lovers, chefs, golfers, readers, children, teens and more. A native of Toronto, Owolabi is the University organist and assistant professor of music in the Setnor School of Music in the College of Visual and Performing Arts. There, he teaches courses in organ, improvisation, continuo playing and baroque chamber music, plays for weekly chapel services and special events and coordinates the Malmgren Concert Series at Hendricks Chapel. He is currently the dean of the Syracuse chapter of the American Guild of Organists. 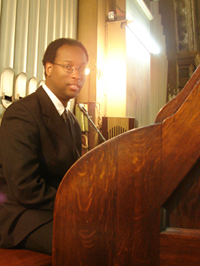 Owolabi is a published composer and has received commissions from the Royal Canadian College of Organists and the Catholic Archdiocese of Toronto. His solo organ composition, “Dance,” has been selected for the Royal Canadian College of Organists national competition in this summer. He has performed across Canada, the United States, Mexico and Jamaica, and regularly performs as an organist and harpsichordist with the Miami-based, Grammy-nominated vocal ensemble Seraphic Fire and Firebird Chamber Orchestra. Owolabi holds a bachelor’s degree in organ performance from McGill University; a master’s degree in organ performance and choral conducting from Yale University and a doctorate in organ performance from the Eastman School of Music. The Lutheran Campus Ministry at Syracuse University is a dynamic community, rooted in worship, that nurtures growth and inspires service in the name of Christ. Students are involved in worship, service learning and engagement in the community and with the environment.